Virginia Stephen was born in London on January 25, 1882. She was the daughter of Sir Leslie Stephen, a famous scholar and philosopher (a seeker of knowledge) who, among many literary occupations, was at one time editor of Cornhill Magazine and the Dictionary of National Biography. James Russell Lowell, the American poet, was her godfather. Her mother, Julia Jackson, died when the child was twelve or thirteen years old. Virginia and her sister were educated at home in their father's library, where Virginia also met his famous friends who included G. E. Moore (1873–1958) and E. M. Forster (1879–1970). Young Virginia soon fell deep into the world of literature. In 1912, eight years after her father's death, Virginia married Leonard Woolf, a brilliant young writer and critic from Cambridge, England, whose interests in literature as well as in economics and the labor movement were well suited to hers. In 1917, for amusement, they founded the Hogarth Press by setting and handprinting on an old press Two Stories by "L. and V. Woolf." The volume was a success, and over the years they published many important books, including Prelude by Katherine Mansfield (1888–1923), then an unknown writer; Poems by T. S. Eliot (1888–1965); and Kew Gardens by Virginia Woolf. The policy of the Hogarth Press was to publish the best and most original work that came to its attention, and the Woolfs as publishers favored young and unknown writers. Virginia's older sister Vanessa, who married the critic Clive Bell, participated in this venture by designing dust jackets for the books issued by the Hogarth Press. Virginia Woolf's home in Tavistock Square, Bloomsbury, became a literary and art center, attracting such diverse intellectuals as Lytton Strachey (1880–1932), Arthur Waley (1889–1966), Victoria Sackville-West (1892–1962), John Maynard Keynes (1883–1943), and Roger Fry (1866–1934). These artists, critics, and writers became known as the Bloomsbury group. Roger Fry's theory of art may have influenced Virginia's technique as a novelist. Broadly speaking, the Bloomsbury group drew from the philosophic interests of its members (who had been educated at Cambridge) the values of love and beauty as essential to life. Virginia Woolf began writing essays for the Times Literary Supplement (London) when she was young, and over the years these and other essays were collected in a two-volume series called The Common Reader (1925, 1933). These studies range with affection and understanding through all of English literature. Students of fiction have drawn upon these criticisms as a means of understanding Virginia Woolf's own direction as a novelist. which Virginia Woolf described the manner in which the older-generation novelist Arnold Bennett would have portrayed Mrs. Brown, a lady casually met in a railway carriage, by giving her a house and furniture and a position in the world. She then contrasted this method with another: one that exhibits a new interest in Mrs. Brown, the mysteries of her person, her consciousness (awareness), and the consciousness of the observer responding to her. Two of Virginia Woolf's novels in particular, Mrs. Dalloway (1925) and To the Lighthouse (1927), successfully follow the latter approach. The first novel covers a day in the life of Mrs. Dalloway in postwar London; it achieves its vision of reality through the reception by Mrs. Dalloway's mind of what Virginia Woolf called those "myriad impressions—trivial, fantastic, evanescent [vanishing], or engraved with the sharpness of steel." To the Lighthouse is, in a sense, a family portrait and history rendered in subjective (characterized by personal views) depth through selected points in time. Part I deals with the time between six o'clock in the evening and dinner. Primarily through the consciousness of Mrs. Ramsay, it presents the clash of the male and female sensibilities in the family; Mrs. Ramsay functions as a means of balance and settling disputes. Part II is a moving section of loss during the interval between Mrs. Ramsay's death and the family's revisit to the house. Part III moves toward completion of this complex portrait through the adding of a last detail to a painting by an artist guest, Lily Briscoe, and through the final completion of a plan, rejected by the father in Part I, for him and the children to sail out to the lighthouse. Virginia Woolf was the author of about fifteen books, the last, A Writer's Diary, posthumously (after death) published in 1953. Her death by drowning in Lewes, Sussex, England, on March 28, 1941, has often been regarded as a suicide brought on by the unbearable strains of life during World War II (1939–45; a war fought between the Axis powers: Japan, Italy, and Germany—and the Allies: France, England, the Soviet Union, and the United States). The true explanation seems to be that she had regularly felt symptoms of a mental breakdown and feared it would be permanent. Mrs. Dalloway, To the Lighthouse, and Jacob's Room (1922) represent Virginia Woolf's major achievements. The Voyage Out (1915) first brought her critical attention. Night and Day (1919) is traditional in method. The short stories of Monday or Tuesday (1921) brought critical praise. In The Waves (1931) she masterfully employed the stream-of-consciousness technique which stresses "free writing." Other experimental novels include Orlando (1928), The Years (1937), and Between the Acts (1941). 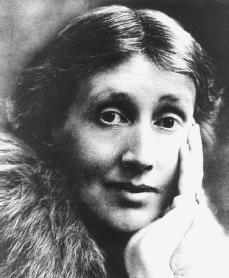 Virginia Woolf's championship of women's rights is reflected in the essays in A Room of One's Own (1929) and in Three Guineas (1938). Bell, Quentin. Virginia Woolf: A Biography. New York: Harcourt Brace Jovanovich, 1972. Bond, Alma Halbert. Who Killed Virginia Woolf? : A Psychobiography. New York: Human Sciences Press, 1989. Caws, Mary Anne. Virginia Woolf. Woodstock, NY: Overlook Books, 2002. Lee, Hermione. Virginia Woolf. New York: A. A. Knopf, 1997. Virginia Woolf has been made a heroine of society. Apart from her books, She was a depressive person who committed suicide. Great heroine. She could not overcome her own mental problems. Cursed Jews and Christians. Lovely Lady indeed. I don't think so. Strange is the word. Strange woman.